A warm, cozy fire pit can be an ideal outdoor retreat for family and friends, especially during those cold winter months. Our 36" x 12" rectangular drop-in burner pan with electronic ignition kit (natural gas) is just what your customers will need to organize such an event. With just the flip of a switch, your customers and their guests will be enjoying a brilliant flame and lots of memorable conversations! 36" x 12" Rectangular Drop-in Burner Pan w/ Built-in H-Burner - Our 36" x 12" rectangular drop-in burner pan comes with a convenient 'lip' so that it can be installed into a fire pit and easily removed after use. These burner pans greatly reduce the amount of fire glass your customers will need to fill their fire pit by creating a false bottom which gives the illusion that the fire pit is full, whereas only the top part of it is. 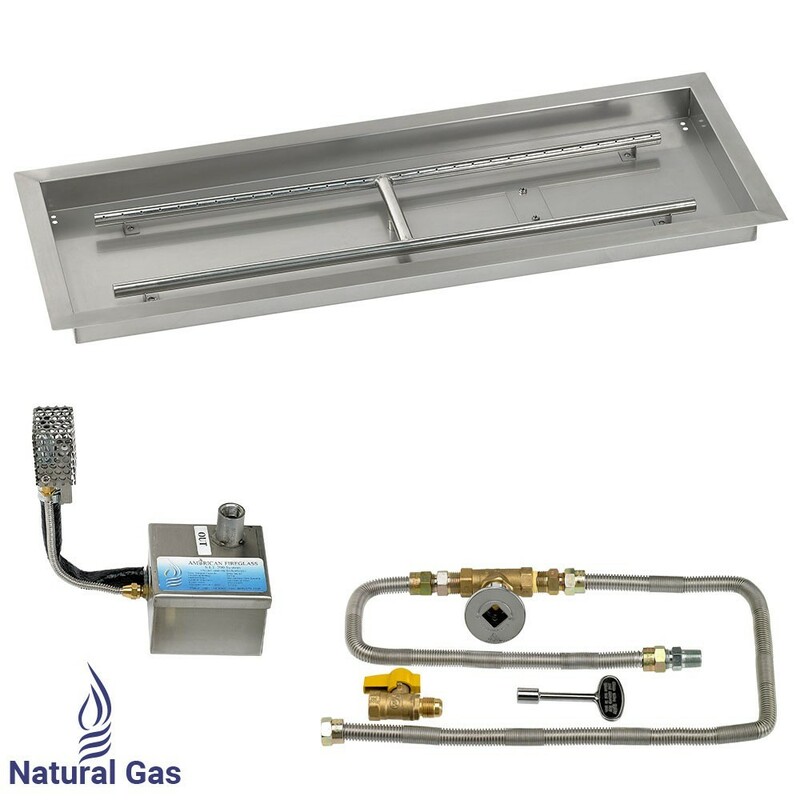 All our rectangular drop-in burner pans are made of 100% stainless steel, which means they are very durable and can withstand extreme heat as well as harsh weather without sustaining any damage or rusting. Each comes with a built-in H-burner and drilled weep holes to prevent water accumulation. S.I.T. Electronic Ignition Kit - Our S.I.T. (Smart Ignition Technology) system is the smallest electronic ignition system available in today's market. Its size makes it ideal for use in fire features with very little vertical space. Developed exclusively to work with fire bowls or fire pit burners, the S.I.T. kit consists of a Hot Surface Ignition control that electronically opens and closes the gas valve. It also features a thermopile with automatic flame sensor for additional safety. This S.I.T. kit has a maximum gas output of 290 BTU/hr, which means it works well with most fire features. Prop. 65 Warning:This product may contain compounds known to the state of California to cause cancer, birth defects, or other reproductive harm.